Mathare Valley compound is located in an old quarry 2km long and 800m wide. 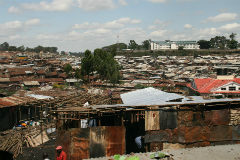 This shanty village is 5 km (3.2 miles) from Nairobi city centre, the capital of Kenya. 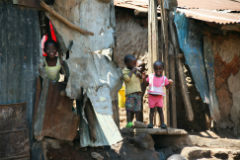 600,000 people live in this area in very poor conditions, many of them children. Disease is rampant. It is estimated that up to half of the residents have HIV. The stream that flows through the centre of the quarry is an open sewer. There is huge tension in the Valley and it often boils over into gang like fighting. There is a lot of violence and criminal activity in the area. Fires frequently sweep through parts of the Valley and people are regularly made homeless or killed by the fires. 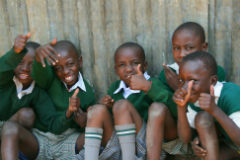 There are 1,600 children in the schools being run by the Mathare Community Outreach (MCO) team. Every day the children are fed a meal which brings a lot of stability to the attendance. They also are involved in the planting of churches in the Valley. The main component of this partnership with MCO is the support of 13 secondary school students, the support of 179 primary school children and the support of a social worker. Bright Hope World started a partnership with MCO in 2000. The first time we visited we realised that it was important to partner with the key person in the initial stages to maintain their enthusiasm and involvement in the project so we started supporting Daniel and Magdalene (KEN01a). The children who come to school are taught and fed every day, which is a mammoth task. The partnership is based in the Mathare compound and some of the other smaller compounds. In the past BHW was involved in both Mathare and Kariobangi. We were able to find a significant donor who took over our partnership in Mathare and we concentrated on Kariobangi compound, supporting the children that live at the school. This is a much smaller slum although the circumstances are little better than Mathare but over time the situation for the children in Kariobangi has improved. 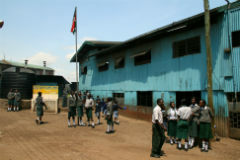 In 2012 a major donor pulled out of the Mathare project. This brought increased pressure on the MCO team so in late 2012 BHW decided to recommence our partnership there by supporting a number of children to go to school. Along with this we have taken up a dialogue about how to assist the partnership to become self-sustaining. The primary beneficiaries are orphans and vulnerable children in Mathare Valley compound. In addition, the families of these children are provided some support where resources are available. This partnership has been going since around 2000 and has developed a good reputation in the area. It is closely connected to local churches. The leaders are of high calibre and motives and there is a great sense of mission amongst the existing and emerging leaders. Bright Hope World have been involved here for a long time, the longest donor in the partnership. We know the leadership well and have more than a working relationship. Through our partner we are able to have a huge impact in a community that resides in one of the most atrocious places on earth. The main leaders and overseers of the project are Daniel Ogutu and his wife Magdalene who are very busy with the children’s work in Mathare Valley. They have five children, Reina, Herma, Bill, and Debra Imani. Magdalene resigned from her job as an accountant in 1994 to work with the people of Mathare. When she first started helping out the starving children in the village she would prepare porridge for the children and teach them songs, Bible memory verses, reading, writing, and arithmetic. This grew very quickly from 15 children to 40 children within two weeks then after one month she was catering for 150 children. At this time she called for help from the church and the work continued. Somewhere between 1910 and 1915 an American missionary ventured into the region of Kisumu Kenya near Lake Victoria to share the gospel of Christ with the Luo tribe. Among many others, a young boy was taken by the gospel story and was led to Christ and discipled by that missionary. That seven-year-old was Pastor Daniel's father. His father later pastored his small village church and raised a large family of devoted Christian brothers and sisters. One of his sons was Daniel Ogutu. After a successful career as an engineer, Daniel could no longer deny the calling that God had for him, and he and his wife gave up all that they had in 1994 to care for the abandoned in Mathare. Thousands of children and their parents have heard the gospel message through the work that God has done using Pastor Daniel and his wife Magdalene. Gilbert Osumbu is second in charge and handles the administration. Gilbert was working as an accountant in a large petroleum company and resigned to help in the ministry. He provides a solid financial backbone to the leadership team and along with Daniel and Magdalene forms the leadership of the ministry. The vision of the Mathare Community Outreach team is to have a responsible community, empowered to address their social, economic, physical and spiritual challenges to the glory of God. 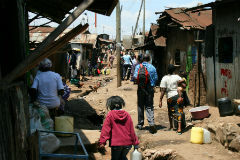 They dream that Mathare could become a much better place and we agree with their vision. Each year we visit and work through a plan for the following year. Currently this involves the support of children at school, and the support of a social worker.